Dodda Basavana Gudi (the Nandhi Temple) is situated in Bull Temple Road, Basavanagudi, area of South Bangalore, part of the largest city of the Indian state of Karnataka. The Hindu temple is inside a park called Bugle Rock. The bull referred to is a sacred Hindu demi-god, known as Nandi; Nandi is a close devotee and attendant of Shiva. Dodda Basavana Gudi is said to be the biggest temple to Nandi in the world. The stone cult image of Nandi is continually covered with new layers of butter, benne in the local language of Kannada. 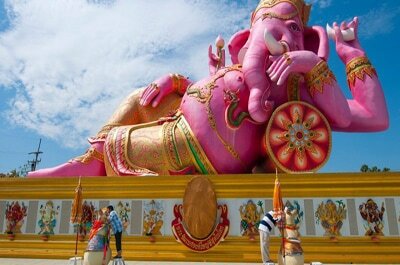 There is a cult image of the elephant-headed Hindu deity son of shiva Ganesha close by. Every year on the last Monday and Tuesday of the Hindu month of Karthika Maasa a groundnut fair is held in the temple premises and groundnut is offered to the deity. This fair is known as 'Kadalekaayi Parishe' in local tongue. Groundnut sellers and devotees throng the place during Kadalekaayi Parishe. Basavana Gudi is a regular place of visit for tourists and is covered by most of the tour operators including the Karnataka State Tourism Development Corporation. Malleshwaram is a north-western neighbourhood in Bangalore city. It's one of the zones of BBMP. It was developed as a planned suburb after the great plague of 1898, which caused many people to move out of the city center. 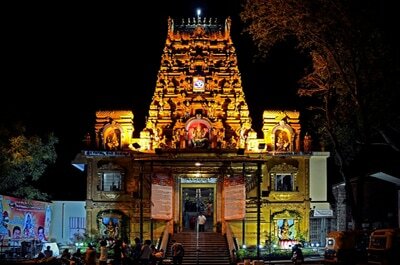 It derives its name from the Kaadu Malleshwara temple. H. V. Nanjundaiah is credited with the founding of Malleswaram. The neighborhood of Malleswaram hosts people from all walks of life. The Nobel laureate C.V. Raman, scientist Krishnaswamy Kasturirangan, badminton world champion Prakash Padukone, noted Carnatic musician Doraiswamy Iyengar and film stars Saroja Devi and Jaggesh have all lived here. The M. Chinnaswamy Stadium, Kannada: ಎಂ.ಚಿನ್ನಸ್ವಾಮಿ ಕ್ರೀಡಾಂಗಣ located in Bengaluru, Karnataka, is one of the cricket stadiums of India. Flanked by the picturesque Cubbon Park, Queen's Road, Cubbon and uptown MG Road, this four decade old stadium is situated in the heart of the city of Bengaluru. Formerly known as the Karnataka State Cricket Association (KSCA) stadium, the ground was later rechristened in tribute to Mr. M. Chinnaswamy, who had served the KSCA for four decades and was also president of the Board of Control for Cricket in India (BCCI) from 1977–1980. This stadium with a seating capacity of around 38,000 not only regularly hosts Test cricket, One Day Internationals (ODI) and other First-class cricket matches, but also other musical and cultural events. 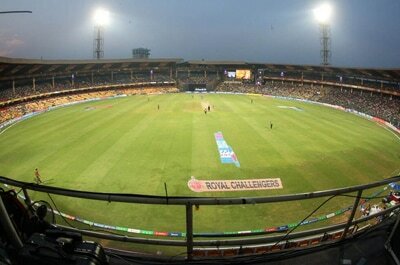 The stadium is also the home ground of the Karnataka state cricket team and the Indian Premier League franchise Royal Challengers Bangalore. It is owned by the Government of Karnataka and has been leased out to the KSCA for a period of 99 years. The Chinnaswamy stadium is also the first stadium in India, and probably the world, to use solar panels to generate a bulk of the electricity needed to run the stadium. This has been procured as by the "Go Green" initiative of the KSCA. 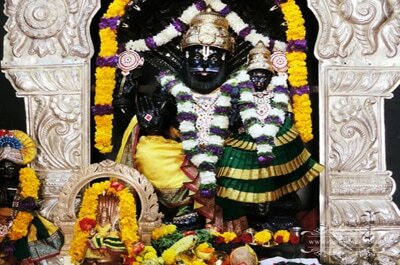 Sri Sri Narasimha Giridhari Mandir in Bangalore is a temple with lot of festivities. Apart from vaishnava festivals celebrated in other ISKCON temples, it celebrates Sri Narasimha Tirumanjanam (Abhishekam) every second Saturday. The mula Deity of Sri Sri Lakshmi Narasimha Deva receives a grand ceremonial bath and vishesha upacharas during this festival. Other deity forms of Lord Narasimha also receive an elaborate abhishek. The Lord receives a grand bhoga offering during the ceremony. Various upacharas like natya, gaana and vadyasevas are also performed during the ceremonial bath. A grand feast is served after the festival. It also conducts a course on Bhagwad Gita on weekends. 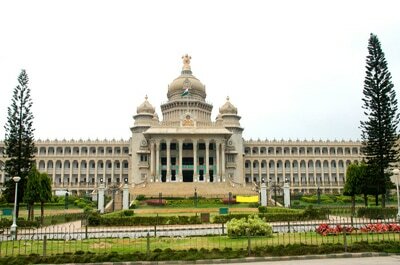 The Vidhana Soudha located in Bengaluru, is the seat of the state legislature of Karnataka. It is an imposing building, constructed in a style sometimes described as Mysore Neo-Dravidian, and incorporates elements of Indo-Saracenic and Dravidian styles. The construction was completed in 1956.Kengal Hanumanthaiah is credited with the conception and construction of the Vidhana Soudha. The foundation stone was laid by the then Prime Minister of India, Jawaharlal Nehru, on July 13, 1951. However, it was Hanumanthaiah who was instrumental in the redesign and speedy construction of Vidhana Soudha. He visited Europe, Russia, the United States, and other places and got the idea of building the Vidhana Soudha by incorporating various designs from the buildings he had seen. It was completed in 1956. He took a lot of interest and effort in building this marvelous granite building. It was ftrytjjioy855meant to dwarf the British-built Athara Kacheri (High Court) building. Hanumanthaiah was criticized for the nearly 15 million rupees spent to construct the building. But the building designed by him is an impressive structure of Neo Dravidian style.